listed here for our next LCASE or NCASE! Become an NCASE or LCASE Sponsor ! This page below is for the conferences! will be presented this year in several regional locations! The conferences have not yet been scheduled, although we expect Teachers' Day at AirVenture in Oshkosh to be held as usual. The regional conferences will be announced as their schedules are confirmed. Please check back here later. Aviation Explorers - and many more. Ice Cores, Satellites, UV Beads, Oh, My! Do you love aviation and want to go the extra mile and share that passion with students? Then, join the FAA’s Aviation and Space Education Team for this hands-on workshop. We will share some new ideas that include some “maintenance” activities for the classroom. Have you ever wired an aircraft for lights? We can show you how in a very simple activity. Even if you know the benefits of using aviation to motivate students – come and learn a few new tricks. REGISTRATION: Free - Compliments of FAA and WAI. Registration includes the workshop and access to the 22nd Annual Women in Aviation, International, Conference and Trade Show from 1:00 – 5:00 pm. Take this opportunity to network with more than 150 exhibitors from the aviation industry. 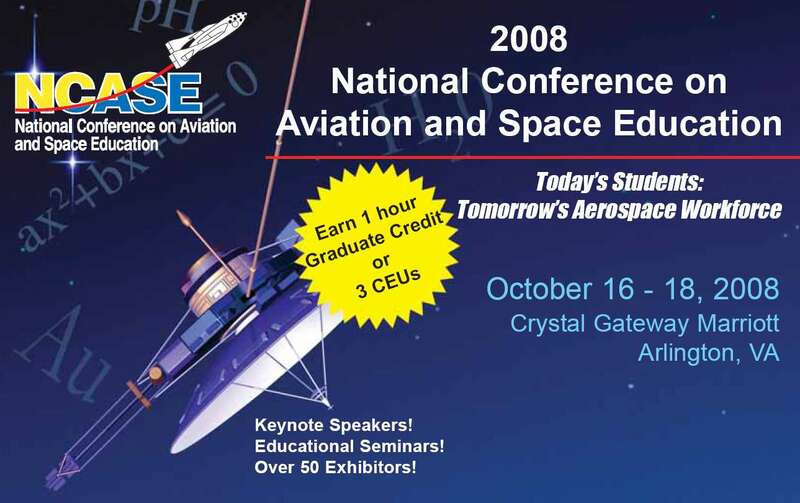 Please visit the NCASE 2008 archives for prior conference information. Ask to be on our email list!